Without soil, we starve. Unfortunately, throughout the world, human activities have degraded dirt, endangering our ability to feed a growing population. How can we save our soil and get ourselves out of a food crisis? How do people benefit from soil? What services does soil provide? 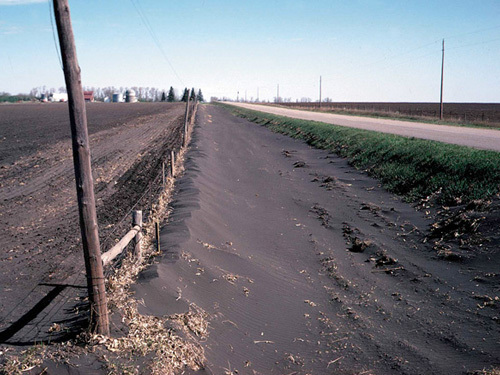 What human activities have put soil in danger? Why is the level of organic matter considered such a key indicator of soil health? Get the dirt on dirt. Here are two interactive introductions to soil from Discovery Education and The Smithsonian. After students explore these sites, have them collect soil samples from different areas to examine, with microscopes, the millions of life forms living in the ground. Ask students to observe other differences in the samples, such as texture and color. Recommended for grades 5-8. Movie time! Show Dirt! The Movie to your students. Lead them in a discussion about what they think are the soil problems in their community or region. Then, have them research the actual problems and what strategies, if any, are being taken to restore the soil. For example, they could interview a local natural resources manager or farmer. Ask them to write a report on what they find and how it relates to the issues the movie raised. Recommended for grades 9-12. Field trip! If you live in or near an agricultural region, take students on a field trip to a farm that practices soil conservation techniques. During the trip, ask students to be on the lookout for soil conservation practices on other farms, as well as poor management practices. Do they notice a difference in soil quality at different farms? Soil, soil everywhere. The Natural Resource Conservation Service lists other soil education resources.